Today's defence-related news includes coverage of a milestone in the development of the F-35B Lightning fleet. The Express, Metro and Daily Star today report that the F-35B Lightning has completed its first test flight armed with British missiles. Minister for Defence Procurement Stuart Andrew announced the successful flight during a visit to the Defence Electronics and Components Agency in Wales, which will play a crucial role in maintaining the world-class jets. The F-35B Lightning fleet has moved another step closer to defending the skies and supporting our illustrious aircraft carriers with this landmark flight. This flight by a British pilot, in a British F-35 jet with British-built weapons, is a symbol of the major part we are playing in what is the world's biggest ever defence programme, delivering billions for our economy and a game-changing capability for our armed forces. The F-35B Lightning multi-role fighter jet is the first to combine radar-evading stealth technology with supersonic speeds and short take-off and vertical landing capability. The British fleet will be jointly manned by the Royal Air Force and the Royal Navy. Read more on the successful test flight. 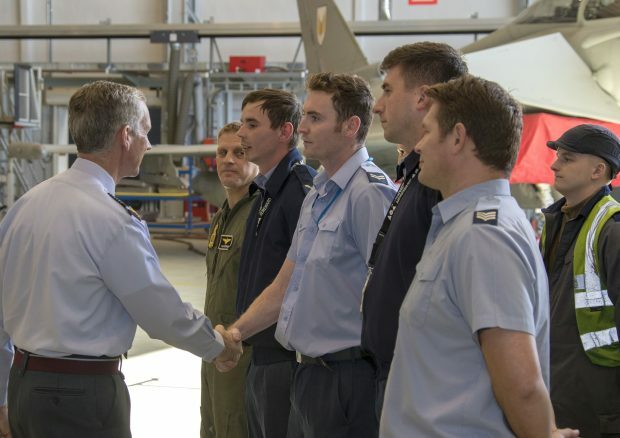 Chief of the Air Staff Air Chief Marshal Sir Stephen Hillier visits RAF Lossiemouth to meet personnel taking part in Op BILOXI, which involves the interception of Russian aircraft flying towards NATO airspace.